Training | Alamo Scouts Historical Foundation, Inc.
On 21 November 1943, LTG Walter Krueger selected LTC Frederick W. Bradshaw, a brilliant attorney from Jackson, Mississippi, to establish an Alamo Scouts Training Center (ASTC) that would combine the best training elements from other elite services with specific skills needed in the jungles and on the beaches of the Southwest Pacific. Under Bradshaw’s command, the ASTC would produce well-trained, highly-motivated, six-to-seven-man teams that could infiltrate behind enemy lines, gather information, and get out undetected. In addition to producing trained Alamo Scouts, the ASTC was used as a base of operations for operational teams. 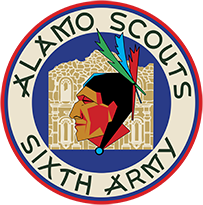 Volunteers for Alamo Scout training were drawn from Sixth Army combat units. Following a multiphase selection process at the division, regimental, company levels, and interviews by the Director of the ASTC, finalists were selected to attend a rigorous six-week training program at the Alamo Scouts Training Center. Candidates received extensive and rigorous training in eight major skill areas: Rubber Boat Handling, Intelligence Gathering, Scouting & Patrolling, Navigation, Communications, Weapons, and Physical Conditioning. Class sizes ranged from 45 to 100 men. Following graduation, approximately thirty percent of the graduates were retained as Alamo Scouts. The Alamo Scouts Training Centers graduated nine classes consisting of approximately 250 enlisted men and 75 officers, from 27 December 1943 to 2 September 1945. Only 117 enlisted men and 21 officers were retained. The remaining graduates returned to their units. YOU MAY HAVE HAD THE IDEA THAT THE ALAMO SCOUTS IS AN ORGANIZATION OF CUT-THROUTS AND TOUGHS. YOU WILL FIND THAT IS NOT SO. WE WANT YOU TO BE TOUGH-JUST AS TOUGH AS YOU CAN MAKE YOURSELVES. BUT WE DO NOT HAVE ANY PLACE IN THE ORANIZATION FOR A TOUGH. THIS TYPE OF WORK DOES NOT CALL FOR BUMS AND TRAMPS. IT CALLS FOR THE HIGHEST QUALITIES OF SOLDIERING…YOU WILL BE CLOSELY OBSERVED DURING ALL OF THE SIX WEEKS YOU ARE HERE. IF IT IS FOUND THAT YOU ARE NOT MENTALLY, TEMPERAMENTALLY OR PHYSICALLY FIT AND UP TO THE STANDARDS REQUIRED; IF IT IS FOUND THAT YOU ARE NOT SINCERELY TRYING–YOU WILL BE RETURNED TO YOUR PARENT UNIT PROMPTLY – THE NEXT DAY. THE OFFICERS OF THE STAFF ARE HERE WITH THE SINGLE THOUGHT OF FURNISHING THEIR BEST IN THE WAY OF TRAINING. TRAINING BEGINS TOMORROW. DISMISSED!